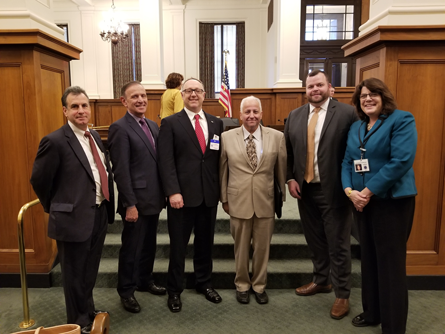 Trenton, N.J.—The Professional Insurance Agents of New Jersey submitted written testimony to support S-2475, which would prohibit application of a fiduciary standard to insurance producers, before the state Senate Commerce Committee on Jan. 17. The bill is sponsored by Senate President Stephen M. Sweeney, D-3, and Senate Commerce Committee Chair Nellie Pou, D-35. The bill was passed out of the committee unanimously and now goes to the full Senate for a vote. Only a handful of states, including New Jersey, have unclear laws regarding insurance producers’ duty of care, which causes many questions to be resolved by case law. “PIANJ supports legislation to clarify that insurance producers are expected to exercise ordinary and reasonable care and skill in renewing, procuring, binding or placing insurance, and are fully liable for negligent actions, but that they are not subject to civil liability under standards governing the conduct of a fiduciary or a fiduciary relationship,” said PIANJ in its testimony. (L-R) PIANJ past President Anthony F. Bavaro, CIC, CRM; past President and PIA National Director Paul Monacelli, CIC, CPIA; President Rip Bush Jr., CPIA; Vice President Michael DeStasio Jr.; Director Andrew Harris Jr., CIC, AAI; and PIANJ Legislative Representative Carol Katz. According to PIANJ’s testimony, the errors and omissions insurance, which protects agencies and their clients in the event of, or allegation of, professional errors, is more costly in New Jersey—compared to peer states—because of the Garden State’s extension of liability beyond the normal duty-of-care. The bill’s provisions also include strengthening the existing “affidavit of merit” statute that, in theory, makes sure that lawsuits must have some merit before proceeding, but which, in practice, often falls short of that goal. According to PIANJ, this legislation protects consumers—both individuals and the many small businesses that turn to insurance agents for their business coverage. It ensures that they will continue to have the access to the expertise and personal attention of an insurance agent whom they know and who, in turn, is familiar with their individual needs. PIANJ representatives who attended the committee meeting in support of the bill included: President Rip Bush Jr., CPIA; Vice President Michael DeStasio Jr.; past President Anthony F. Bavaro, CIC, CRM; past President and PIA National Director Paul Monacelli, CIC, CPIA; Director Andrew Harris Jr., CIC, AAI; Government & Industry Affairs Committee Member Christopher J. Powell; and PIANJ Director of Government & Industry Affairs Bradford J. Lachut, Esq. Clarifying and standardizing the level of care insurance producers are expected to exercise is one of PIANJ’s top legislative priorities that the association is working toward this legislative session. It also is addressing the importance of accurate quoting of automobile policies and combating personal auto “step down” provisions in personal automobile policies.